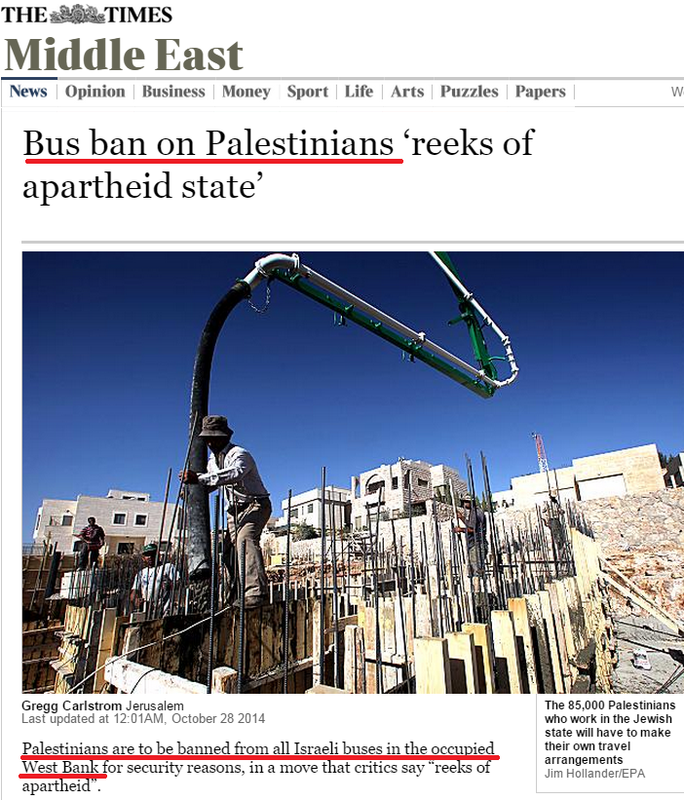 Despite what Times of London claims in an Oct. 28th story by Gregg Carlstrom, there is no ‘apartheid-style’ proposal by Israeli officials to ‘ban Palestinians from riding Israeli buses’. According to Haaretz (and other media sites which covered the story), the new security edict being proposed by the Defense Ministry would require Palestinian laborers who enter Israel through the Eyal checkpoint (mostly those heading to work in Tel Aviv or central Israeli towns) to head home at night through the same IDF checkpoints from which they entered. Previously, on the return trip back into the West Bank, Palestinian workers were free to choose alternative routes which would allow them to get closer to their homes and with less delay – including those bus lines passing straight through checkpoints and stopping at settlements. Reportedly, the new proposed rules would only apply to the Eyal checkpoint and not initialy apply to those entering at other crossings. Indeed, Carlstrom – unlike other sites which covered the story, including Haaretz – didn’t included even one statement from an Israeli official contradicting his characterization of the proposed new rule, or explaining its rationale. It would be quite fair to say that the new policy, if implemented, would have the effect of making it extremely less likely that Palestinians in the West Bank entering Israel via Eyal will use Israeli bus lines to return from work in Israel. However, to state, as the Times of London article did, that Palestinians will be “banned” from Israeli bus lines is false. No such rule has been proposed. Indeed, whilst commentators can reasonably take issue with the new proposed rules, and the injurious impact it may have on Palestinian laborers, based on what’s been reported thus far there is no reason to believe that even one Palestinian will be denied service on Israeli bus lines – the necessary condition to claim that there’s a “ban”. Who’s more “far-right”, Yehuda Glick or the Palestinian who tried to murder him? Off-topic, but highly relevant: your site inspired me to contact the International Business Times, who recently published an Israel-related article based on a hoax announcement (“Anonymous Shuts Down Israeli Government Websites In Retaliation for Killing 14-Year-Old Orwah Hammad”). The announcement listed a bunch of government agency sites that Anonymous supposedly shut down, but most of the URLs were fictitious — for example, using http://www.defence.gov.il instead of http://www.mod.gov.il for the Ministry of Defense. I gave a list of corrected links to show that the announcement was a hoax, and hope that they retract the article. They spell it ‘defense’ in Israel. Antisemites are so stupid. I must live in an Apartheid state also because there was a time when bus drivers refused to go to some suburbs of Perth because it was too dangerous for them to drive in, since they were constantly being attacked and having rocks thrown at them.